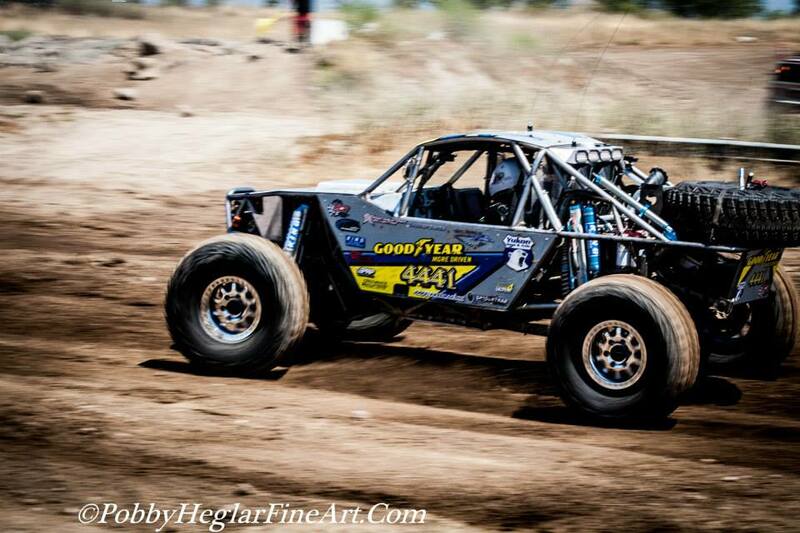 June 6-7, 2014 – Awaking from the aftermath of the 2014 King of the Hammers, the Western Ultra4 racing community officially began the 2014 series with the Metal Cloak Stampede in Prairie City, CA – home of the NorCal Rock Racing series. With the largest list of drivers ever entered in a series event, over ninety-nine teams gathered in 100+ degree heat ready to battle it out for top honors. D2R was one of these teams, armed with the newly updated Trent Fab Top Shelf IFS car; this race would be in indicator of what to expect in the upcoming season. Friday, teams had the opportunity to practice on the two mile track combining hairpin turns, wide open straight-aways, long jumps, and boulder fields that were sure to test all aspects of the Ultra 4 cars. The fastest practice lap also translated into what starting order would be for the preliminary heats, D2R managed a solid 8th fastest lap, which would put us starting 3rd in our heat. In the preliminary races, only the top 3 cars would progress directly to the main. All other competitors would take on an afternoon of racing other heats to gain access to the main event the following day. Blasting off the starting with mud flying from a freshly watered track, the 4441 car was able to pass on the 1st corner, and began the hunt down on the only other car ahead – a pass that would happen 10 minutes later and D2R would take 1st place position. Dsquared held 1st for better than half the race. With two laps to go, the 4441 car popped two spark plug wires loose and the engine started to miss. On the last lap, the car hit a large rock causing the steering pop-off valve to spray a bit of fluid on the engine, resulting in a large cloud of smoke. Thinking that the engine had let loose, D2R pulled over to access the situation. After a quick review of the gauges with the driver, D2R decided to go for it. “Screw it,” said Darlene Henke, co-driver, “we have another engine, if this one blows we have a backup!” In the short seconds the car was pulled over, second place had passed and now D2R was in second. With massive horsepower restricted down to six cylinders, the 4441 car still had plenty of power to get back on track, complete one more full lap, and almost caught back up to first place! Crossing the finish line in a close second, D2R learned later they had completed their fastest lap time on six cylinders! Prelims where done for Dsquared, it was time to get the car prepped for the main event and get some rest. Saturday afternoon the main event started at 6 pm. Dsquared would start the main event in the number 8 position out of a total of 25 cars. The main would kick off with a rolling start, and the track begins with a long jump slamming right into a hairpin banked turn. Holding solid in this turn is essential to gaining position before you jump into a boulder field. Dsquared held this position through the turn and jumped a position before heading into the rocks. Dashing through the rocks and spinning a hard left turn D2R hit the long straightaway and mashed the throttle pedal. Keeping pace with the leaders and starting to create distance from the followers, the car ran perfect. Holding temperatures, gliding over the terrain, the Dsquared team had 45 minutes to hold the car together and yet still try to catch up with the leaders ahead. The decision had been made by Ultra 4 to have a restart after 25 minutes of racing, getting all the cars back together to make for better spectating. When the full course yellow flag was thrown, not all the flagmen had followed suit and confusion was abound. All drivers were supposed to slow down and not pass, this did not happen and many racers were incorrectly passed during the yellow, causing an incorrect restart. Not realizing what had happened, Ultra4 restarted the race without addressing the issues with course positions. After the restart, Dsquared was bumped back a couple of positions,and everything the car had to offer was needed for the restart to gain position back. After the first hairpin turn on the restart, a driver from behind attempted a pit maneuver on the 4441 car, which almost threw D2R off the course, but even after the save, had resulted in a slit in the tire from the hard impact of the other car. D2R ran a full lap on the flat tire before entering the hot pit for a change. On a mission, Darren and Darlene drove the car to its fullest extent, trying to make up a lap due to the tire change. For 15 minutes the fight endured until a bad line through one of the rock sections ripped the rear driveshaft out of the car. With only five minutes left of the race, Dsquared was out. With no spares and no time left, the Dsquared team was only left to watch the rest of the race from the sidelines. After the checkered flag was thrown and the dust settled, D2R finished in the number 16 position. Although not the best finishing position, D2R considers this race a victory. It was the first Ultra4 race in the new IFS car; we pulled off a podium in the prelims, kept up with the very best drivers in the main, and qualified for 2015 King of the Hammers. On the sidelines after the races, we received many compliments on how well the car not only looked, but on how well it handled everything we threw at it. The best part is, this was only the first U4 race in the car, and we have nothing but improvement with more seat time. Leading up to the race, Dsquared continually posted status updates and pictures to our social media outlets, and also high quality video taken the day of practice and following day of the race. The DsquaredRacing fans continue to grow and just in a matter of one weekend, the teams FB likes and Instagram likes are significantly up. The video footage shared, received almost 200 additional shares to other pages and received over 70,000 views. We will continue to promote our team, and sponsors, via our social media outlets and look forward to the next race in just under three weeks.